Comic-Con Day 4: The Monstrous Regiment San Diego Comic-Con ended on Sunday, and our intrepid correspondents Mallory Yu and Petra Mayer report on an Eisner Awards ceremony (the Oscars of comics) dominated by women and writers of color. A page from Emil Ferris' Eisner Award-winning My Favorite Thing Is Monsters. Women and creators of color were big winners at this year's Eisners. San Diego Comic-Con wrapped up on Sunday. NPR comic buffs Mallory Yu and Petra Mayer discuss highlights of the convention's last day, in which women, writers of color — and monsters — took front and center. Petra: Mallory, oh, my God, we made it. We made it. We almost got sidetracked just trying to find a place to sit down and eat some crummy convention concession pizza (although by Grabthar's hammer, crummy convention concession pizza was what my soul desired) but we made it through the week. Petra: Seriously, though, aside from waiting in lines, the more elaborate crowd control this year means the OTHER signature Comic-Con experience is trying desperately to get from point A to point B but being shunted through Q, 13 and Albuquerque by new barriers and checkpoints. But that does lead to some odd moments of serendipity — I was trying to find my way out of the upstairs hall where most of the panel rooms are when I passed by some friends who just happened to be chatting with the actor Isaiah Washington, of Grey's Anatomy and now The 100. And he just happened to be willing to take a few minutes to tell me about the comic project, Bison, that he'd just announced. 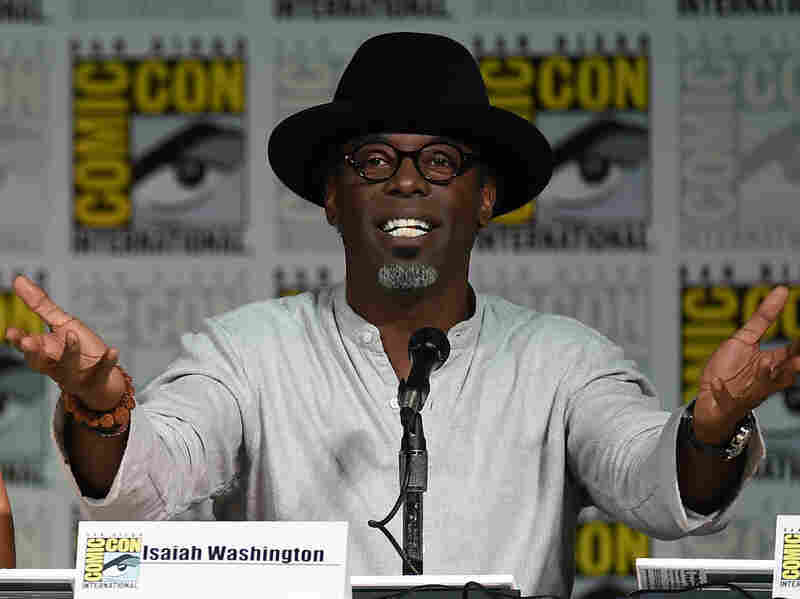 Actor Isaiah Washington at a panel for The 100 back in 2015 — this year he announced a new comic project, called Bison. "I've been coming to Comic-Con since 2013, but it was mostly because I was part of this wonderful sci-fi show called The 100," he told me. "So I thought, you know, wow, since I'm in the sci-fi community, maybe I should take advantage of the comic book world as well." Washington said he was interested in black heroes, particularly a character called Blue Marvel, created by Kevin Grevioux. Washington and Grevioux started talking and discovered a mutual admiration — "Once we got past fangirling each other, then we started talking about some ideas, some possibilities and some dreams of things we wanted to do." They came up with a bunch of concepts, Washington said, but the one that stuck was Bison. The book will be about a Buffalo Soldier, he told me — not a superhero, just a normal Buffalo Soldier trying to help a group of settlers cross the plains. I asked him what he hoped readers would get from the book. "I think that it opens up that conversation about, mostly, African-American heroes in the military ... and also, it will move that conversation that, okay, black men with guns are maybe not all bad." The other big thing I did today was moderate a spotlight panel with the great and good Emil Ferris, author of My Favorite Thing Is Monsters, which, if you haven't read it, go forth and do so right now. It's a semi-fantastically-maybe-autobiographical graphic novel about a young girl growing up in a rough part of Chicago in the 1960s — a girl who desperately wants to be a monster, who's unsure about her sexuality, who sees beauty in strangeness and who's utterly driven to investigate the murder of her mysterious, glamorous, Holocaust-survivor upstairs neighbor. Reading it was like falling backward into a dream, something dark and unfolding and layered that kept getting more and more complex in ever-unexpected ways. 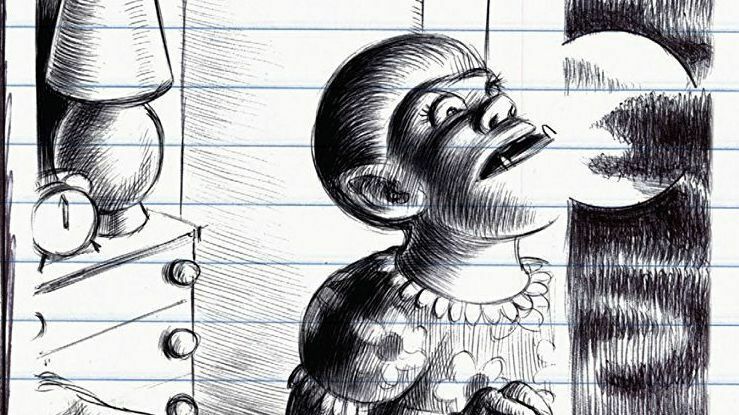 I could have spent hours just poring over her grotesque but heartfelt faces and made-up horror-magazine covers, all done in pretty much just Bic pen (what?!). Mallory and I kind of tag-teamed Ferris — Mallory is reporting a profile (stay tuned!) and then I got her for the spotlight panel. And I wish I had been recording it, or in any way remembering the intense, meaningful things Ferris said about the beauty of monsters, and how we're all monsters — it's not us, it's the villagers who are the danger. And about how we all need to tell our own stories — which, in a place dedicated to telling and celebrating stories, seemed like a wonderful way to end my Comic-Con. She teared up more than once, talking about the obstacles she'd overcome to create her book, and the dark places she'd had to visit. Mallory, you were at the panel, do YOU remember it better? This fangirl haze, it's getting ... distracting. Mallory: I do remember. She talked about how we're all monsters inside, and how we need to accept that because "the monsters are the interesting ones!" As someone who felt like a monster, an outsider, for a lot of her life, it was really meaningful to hear her validate and embrace that. She had a lot to say about the villager mentality — this fear of "the Other" — and the ways in which it can be toxic and harmful. I think my favorite part of that panel was when, during a Q&A portion, a young boy — maybe 12 or 13 — raised his hand to give Emil a little care package he'd made for her to thank her for "being the greatest cartoonist alive." She seemed really surprised! "Wait," she said, "are you sure you want to give that to me?" When he nodded, she laughed. "Well, alright. Thank you, that's very kind of you." He handed her the little package and she exclaimed, delightedly, that it was a stack of old Elvira comics. "You knew just what to get me!" She went on to ask him if he drew and he said he did but he wasn't very good. She straightened up in her seat and told him that he just needed to keep drawing and not to give up, then she offered to keep in touch with him to encourage him and help him. Interactions like this are the greatest parts of coming to conventions like this: one person's story touching another person enough to reach out, and forming connections with like minds. I spent the rest of the day admiring cosplay as I tried to find my way from one interview to another, or from panel to exhibition hall. Like Petra said, the way staff were directing crowd flow didn't quite seem to make sense and it was frustrating to be told so often that you couldn't take the most direct route to where you wanted to be. Half my steps each day at Comic-Con are from having to backtrack! My poor knees! At least there are so many interesting things to see along the way, but I'm definitely going to need a massage when I get back to D.C. It's our last entry (we made it, Petra, THANK GOD), so I'm allowed to get a bit sappy and reflective, right? I find that I tend to focus on the issues within the comics industry, and sometimes I wonder why I became a fan of such a maddening form of media. Then I come to a place like San Diego Comic-Con, and I'm able to spend a weekend talking to artists and writers about why a comic was the best way for them to express their stories. This weekend has, funnily enough, filled me with a sense of optimism for the direction of the industry, and I think the Eisner Awards handed out last night were a good sign of that, as women and people of color had big nights. Petra: I think you are TOTALLY allowed to get sappy and reflective, especially after an Eisner Awards ceremony that gave us so much hope about the direction that comics are going in, at a convention where so many creators and fans seemed focused on seeing each other and truly being seen. Mallory: Marjorie Liu became the first woman ever to win a Best Writer Eisner for her work in the graphic novel Monstress. Let that sink in: Liu is the first woman in the 30-year history of the awards to be awarded for her writing on a comic. It's not shocking that we're only just beginning to fully recognize and celebrate women writing comics, but it's so exciting and well-deserved. In total, Monstress won five awards throughout the night — with Liu and artist Sana Takeda each receiving three awards for their work. When I interviewed Liu in 2016, we talked a lot about how and how the experience of being an outsider — as a biracial Chinese-American woman — helped spark a love for the supernatural and the monstrous. And speaking of monstrous, Emil Ferris also won three Eisner Awards — for best graphic album, best writer/artist and best coloring. I hold this award and I declare war on an antiquated mentality that tells us our voices and our stories aren't profitable enough ... We're not waiting for you to catch up anymore. Other notable wins: Elements: Fire, A Comic Anthology by Creators of Color, edited by Taneka Stotts won for Best Anthology. In her acceptance speech, Stotts said, "I hold this award and I declare war on an antiquated mentality that tells us our voices and our stories aren't profitable enough ... We're not waiting for you to catch up anymore. We are here, we have always been here, and we will do what you've always told us — 'We'll make it ourselves.' "
Jackie Ormes and Carol Kalish both received posthumous inductions into the Eisner Hall of Fame. Ormes is known as the first African-American woman cartoonist and creator of the Torchy Brown comic strip. And Carol Kalish is credited with pioneering the comics direct market. Charles Addams, as in Addams Family, was also inducted, as was Karen Berger, the comic book editor who helped establish DC Comics' Vertigo imprint. (Petra: AHHHH the BEST era of Vertigo if you ask me!) Dave Gibbons — of Watchmen fame — and Rumiko Takahashi also received the honor. Takahashi was a manga creator who created some influential series as Urusei Yatsura, Ranma 1/2, and — my personal favorite — Inuyasha, which was one of the first manga I ever read and helped spark my interest and love for manga and anime. When her name was announced, the room erupted in cheers and applause. It's really hard for me, when I'm in a room full of people who all love comics, not to love comics too. It's even harder when I look around and I see the future of comics: young people, women and especially women of color in the industry working hard to tell their stories. It's extremely heartening to see women rewarded for their writing, their art, and their contributions to the industry as a whole. I've always hated that saying "behind every successful man is a woman" because I never understood why the woman had to be behind. At the Will Eisner Awards, women weren't — they were right up on that stage, being celebrated. So I leave Comic-Con with achy feet and also a renewed sense of optimism. The comics industry is far, far, far from perfect; there's so much about it that's frustrating and terrible, but the industry will continue to shift and change as young people, passionate about what they do, find their footing within it, and I have to admit, I'm looking forward to seeing where it goes from here. That's it! Petra and I both depart San Diego tomorrow (maybe with lighter wallets than when we arrived). We hope you've enjoyed this peek into the hectic, wild, singular experience that is San Diego Comic-Con.